“Bulbs” is a term loosely used to include corms, tubers, tuberous roots, and rhizomes as well as true bulbs. A true bulb is a complete or nearly complete miniature plant encased in fleshy modified leaves called scales which contain reserves of food. 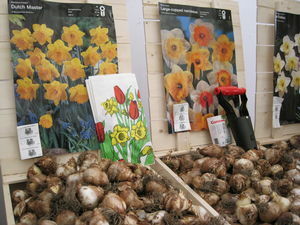 Bulbs are broadly grouped into spring-flowering (January-May) and summer-flowering (June-September). 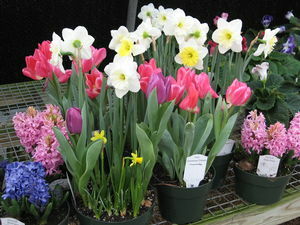 Spring bulbs provide early color before most annuals and perennials. 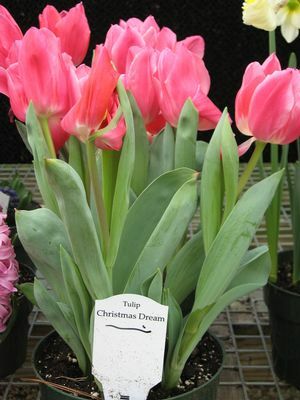 One of the most popular spring bulbs is the tulip. Tulips come in all colors except blue. Some of the most common types are: Cottage-late-blooming; Darwin-tallest; Lily floweredpetals recurve in a bell-shape; Parrot-twisted, ruffled petals; Double-2 or more rows of petals. 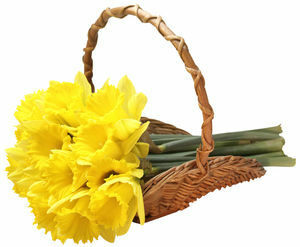 Daffodils and jonquils (common names for the genus Narcissus) are classed by length of corolla in relation to perianth segments. They come in the colors of white, yellow, pink, and peach. Many have naturalized. 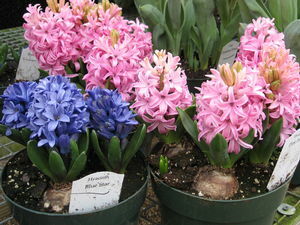 Hyacinths produce a large single spike of many small, fragrant flowers, and come in a complete color range. Crocus are usually grown for early bloom (in snow). Crocuses are available in white, purple, yellow, and bicolors. For instructions on the care and maintenance of flowering bulbs, please click here to download a helpful article, courtesy of the VA Cooperative Extension. Following is a list of bulb plants we have available for spring. To check immediate stock, please call us at (540) 943-8408. Courtesy of the VA Cooperative Extension. Plant bulbs in Fall for Spring blooms. Here's how.